Have you ever noticed how often we create barriers to our own success? Whether it’s caused by self-doubt, negative anticipation, or a general feeling that things are not going our way, a negative mindset can lead us to hold back, doubt our own potential, and sabotage our career success. In this webinar, Dr. Pedro Cortina, Managing Partner at the Innerland Institute, will lead us on an exploration of the ways to identify and transform these self-made obstacles into clear and actionable opportunities. You will also learn five key questions that will help you avoid self-sabotage. 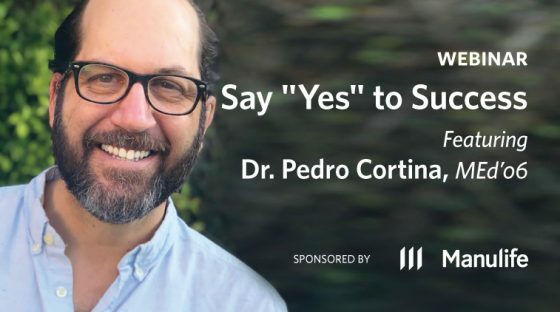 Pedro Cortina is an author, Master Coach, speaker, counselor, facilitator, philosopher, trainer, transformation specialist, as well as a leadership expert with more than 20 years of experience. He offers his clients a profound space of exploration and grounding to identify and transform what is getting in the way of their passion, purpose, and success. He is also the author of the book Curflexion, a guide for moving away from our underlying human experience of separation and unfulfillment. Pedro holds a bachelors in philosophy and economics. He also has master’s and doctoral degrees specializing in leadership and entrepreneurship from the University of British Columbia, and the University of Calgary. He also teaches in areas of leadership, strategy, mentorship, and human resources in recognized business schools. He is a certified counselor by the American Philosophical Practitioners Association in New York and a graduate from the Finance Program for Senior Executives at the University of Oxford. Additionally, throughout his life, he has fully immersed in several eastern transformational traditions such as Mahamudra, Dzogchen, and Advaita.